Why is the PSP Getting Pro Evolution Soccer, and not the Vita or 3DS? Pro Evolution Soccer won't have Xbox One or PlayStation 4 versions. No surprise there. It won't have a Wii U version. Even less of a surprise there. It won't publish on the Nintendo 3DS or the PlayStation Vita, either. So why is it still coming out on the PSP? The Wii U has Nothing to Offer a Sports Fan. Does It Even Matter Now? That's right, the PSP. Of the licensed sports video games that published PSP versions in 2012 (PES, FIFA 13, MLB 2K12, NBA 2K13) only Pro Evolution Soccer 2014 is announced for Sony's venerable handheld in 2013. On Twitter, Adam Bhatti, the game's European community manager answered why the PSP is getting a release but not the Vita. "[B]ecause there's still demand for it," he wrote to a couple of fans. "Does it matter? A very small team work on it. Very small." It stands to reason; the PSP remains popular in Japan, where Pro Evolution Soccer is the top football title despite FIFA's dominance elsewhere in the world. But still, why not the Vita, nor the 3DS? "The install base isn't great," Bhatti said of the Vita. 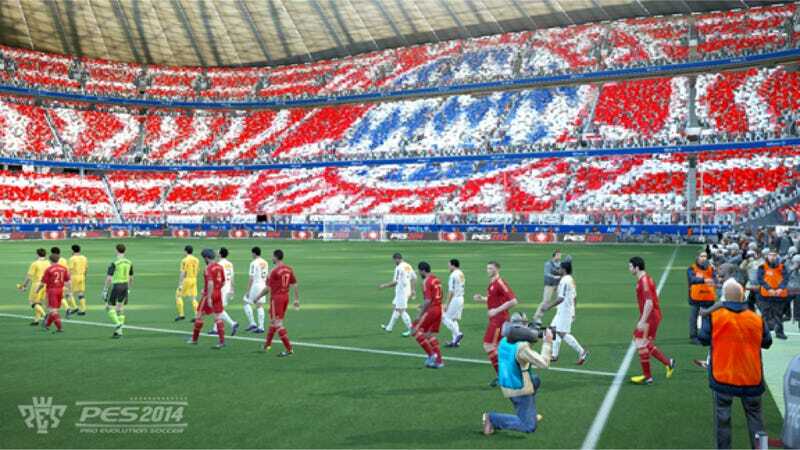 As for the 3DS, Pro Evolution Soccer did publish versions each of the past three years. "No one bought it," he said. Konami is more focused on getting things right with this franchise in the current console generation's curtain call. The Fox Engine, which Metal Gear Solid uses, is meant to bring a solid upgrade to a franchise that made great strides against the FIFA behemoth last year, but still has work to do to look state of the art even on a PS3 or Xbox 360. Bhatti knows this. "The fact we're not on PS4/Xbone with PES 2014 is simple," he tweeted. (Did he really just call it the Xbone?) "We can't and shouldn't be just using higher quality textures etc should be new. "It's hardly amazing making the nextgen version prettier," he added. "We shouldn't have that mentality, and you shouldn't expect that. Aim higher." Konami, he said, doesn't "have the money or resources to build two unique engines," and it "will not make simple high res version." "In the past people accused us of being lazy," he continued. "We're adamant of not making the same mistakes, and making sure we create amazing football games." Overnight, Konami released three more screenshots (one is above) to complement this trailer on Friday teasing the game under the Fox Engine. They were accompanied by a features rundown that listed new physics modeling called "TrueBall Tech" and the "Motion Animation Stability System," which enhance how the ball performs and how players tackle and defend, or overcome the defense. More details are available at the link.